The 4 November missile launch by Houthi rebels in Yemen towards the Saudi capital Riyadh prompted an unexpectedly harsh response. Almost immediately, the Saudi-led coalition announced a complete land, sea and air embargo on Yemen. The Saudis have since reopened air, land and sea access to ports under the control of Yemen’s president Abdrabbuh Mansour Hadi. However, Hudaydah port on the Red Sea, despite being reopened to humanitarian aid on 22 November, crucially remains closed to commerical cargo. Hudaydah port is under the control of the Houthi rebels and is the transit point for the majority of north Yemen's food and fuel. I witnessed firsthand the beginnings of the embargo. 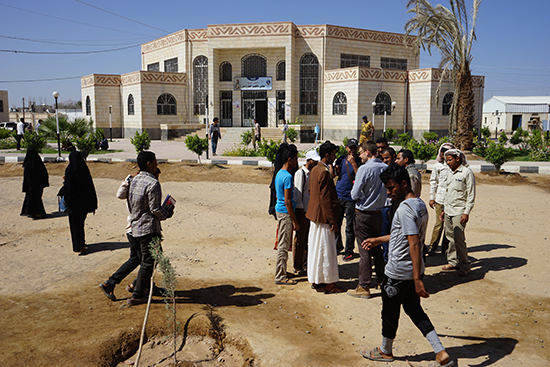 The day it came into effect, I was with a group of journalists travelling to the eastern Yemeni airport of Seyoun. This prompted an immediate 24 hour dash to the Omani border in order to exit the country. The previous six days had been spent in the central governorate of Marib, under an invitation from the governor, Sultan al-Arada. The Sanaa Center for Strategic Studies, where I work, had organised entry for a dozen or so Western journalists. This was an exceptional trip given the extremely limited access for journalists over the course of the conflict, largely due to the Saudi-led coalition’s restriction of visas. The governorate of Marib has also been almost completely inaccessible due to the historical presence of Al-Qaeda. 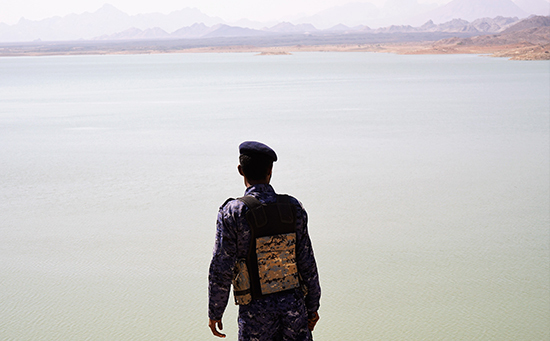 Yemeni government soldier looks over Marib Dam towards Houthi controlled hills. The closure of Hudaydah port spells catastrophe for a country already facing the world’s worst humanitarian disaster. Hudaydah port is the entry point for the majority of northern Yemen’s food and fuel, as well as humanitarian aid servicing 70% of the Yemeni population. Over two thirds of the country, almost 21 million people, are categorised by the UN as food insecure, with 7 million considered highly insecure. The economy has collapsed, with the Yemeni Riyal having lost almost half its value over the course of the conflict, further devastating a population that imports the vast majority of its food and fuel. In other words, Yemeni markets haven’t run out of food, people just can’t afford it. This year alone Yemenis endured the largest cholera epidemic on record, with more than 900,000 cases and at least 2,183 killed. This situation will likely worsen. Following the implementation of the blockade, a number of cities have already run out of fuel to pump drinking water. The capital itself is predicted to run out of water within two weeks. Before considering the reasons for the blockade, we must first recognise the extent to which the Saudi led war effort has faltered. Billions of dollars have been spent and tens of thousands of Yemenis have been killed, along with hundreds of coalition soldiers. The Saudi led war effort has struggled to gain effective local partners – most appear more interested in cementing a local position rather than fighting the coalition's war. For months, the frontlines have barely shifted. In the south, Operation Golden Spear, an offensive designed to drive north along the west coast and capture Hudaydah, has also stalled. Elsewhere the conflict is mostly static. Anti-Houthi forces in the besieged city of Taiz are largely Salafist militias with a complicated relationship with the central Hadi government and coalition. 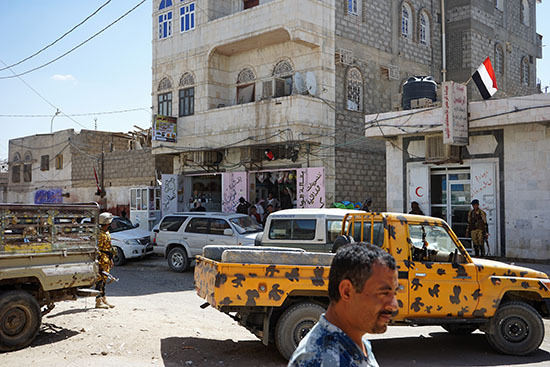 In the temporary capital of Aden and much of the south, tensions continue between secessionist forces represented by the recently formed Southern Transitional Council and those loyal to the Hadi government, occasionally threatening to break into outright conflict. In many areas, the fighting has taken on a purely sectarian nature. This is a phenomenon relatively new to Yemen and one which provides ripe grounds for extremist groups to flourish. Indeed, despite significant efforts to flush them out, al-Qaeda’s presence remains strong in a number of governorates. Islamic State, although comparatively less influential, is consolidating its presence. With anti-Houthi resistance waning among its local allies, the coalition has had to resort heavily to the use of foreign soldiers. Sudan, a member of the coalition, has deployed thousands of men to the country. These are not regular army units but the Janjaweed militiamen, a group notorious for human rights abuses during fighting in Darfur. Casualties have been high, with an estimated 500 Sudanese deaths alone. Internationally, cracks are also beginning to appear in what were the coalition’s steadfast allies. The US has provided significant intelligence and logistical support over the course of the conflict, but recently the House of Representatives passed a non-binding resolution stating US assistance to the coalition is not authorised. Despite the conflict’s essential stalemate, costs remain high. This was evident during our visit the central city of Marib, headquarters of the Saudi-led coalition in Yemen. Located near the crucial frontline in Nehem, itself only a few kilometres from the Houthi-held capital, Sanaa. Local hospitals are so overwhelmed with amputees that they each have prosthetic workshops. Prosthetic outputs of 15 per week are barely enough to meet demand – a problem made worse by the huge number of mines left by retreating Houthi forces. Prosthetics workshop at Marib hospital. The city of Marib itself bears the very visible scars of the fighting that took place in 2015 when Houthi forces pushed deep into the governorate. The hotel we stayed in, despite extensive renovations, bore marks of the rocket strikes that rained down from the hills overlooking the city that Houthis once controlled. Posters in the hospital featured dead soldiers. Some had been killed only days before our visit and hundreds of fresh graves mark Marib’s cemetery. During my discussions with soldiers recovering from their wounds, they seemed eager to re-join the fight against the Houthis. But they bemoaned the irregularity of their wages, one saying he was last paid four months ago. Despite significant financial support from the coalition, soldier and public sector wages alike continue to be intermittent and unreliable, with corruption and graft rampant. Local officials gave anecdotal accounts of battalions that were thousands strong on paper, but in reality could only muster a fraction of that number. The issue of “ghost soldiers” is endemic to Yemen, a common method of graft that began well before the present conflict, but one that presents a significant challenge for coalition partners seeking to motivate local allies. Security in Marib city is tense and AK-47 rifles are commonplace. The ongoing blockade should not be viewed as a tactic of war, but rather within the context of internal Saudi developments spearheaded by the current Crown Prince, Mohammad Bin Salman (MBS). The blockade is part of an effort to refocus international attention on Iran and away from Saudi’s political restructuring. This, along with the forced resignation of Lebanese Prime Minister Saad Hariri, marks an attempt to ratchet up sectarian and national fervour, to consolidate MBS’s domestic position in the wake of his drastic internal purge against royal and business rivals. The Saudi led coalition’s intervention in Yemen has, by most metrics, been a complete failure. The recent missile strike on Riyadh is a blatant indication that its intervention in Yemen has only served to weaken security on its southern border. Perhaps Yemen’s blockade may improve MBS’s position during a period of unprecedented domestic turmoil, but at the direct expense of millions of Yemenis.